Put all the kofta ingredients into a large bowl and use your hands to mix everything together. Shape into small ovals (60-80g each) and press mixture together firmly to ensure the kofta keep their shape. When the salad and hummus are ready and you are just about ready to serve, heat a tablespoon or two of olive oil in a large fry pan (or a barbecue flat-plate) and sear the kofta on all sides until golden brown and cooked through - normally 6-8 minutes. If the pan isn’t big enough for the kofta to be in a single layer, do this in batches. Serve immediately with toasted pita bread. Bring a large pot of water to the boil (large enough to fit the corn in). Preheat the oven to 200°C and line an oven tray with baking paper. Cut the carrots into wedges and toss with olive oil and a liberal grind of salt and pepper (see photo). Lay out on baking tray in a single layer and roast for 20-30 minutes or until nearly tender. Husk the corn and cook in the boiling water for 6 minutes. Remove to cool. When cool, cut the corn off the cobs with a sharp knife. Heat a medium fry pan over high heat with a tablespoon of olive oil. Cut the zucchini length-ways into stripes and fry for a few minutes on each side until golden-brown. This can also be easily done on the barbecue. Mix together the ingredients for the dressing in a small bowl or mug. Taste to adjust seasoning. 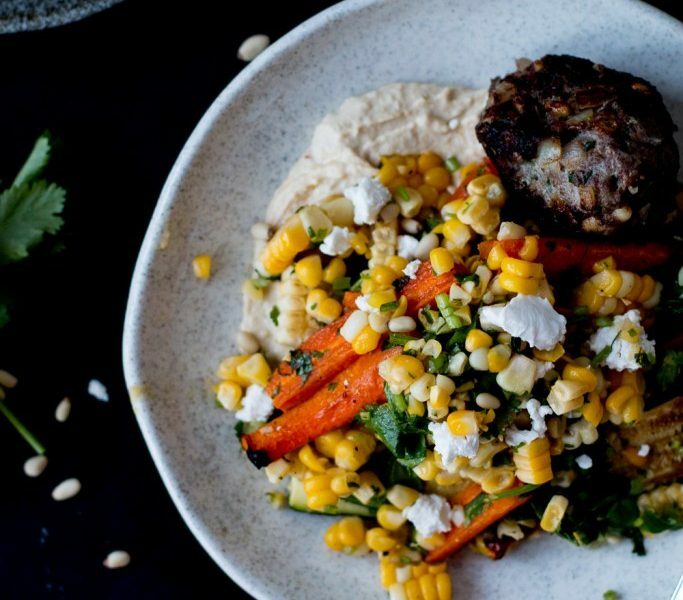 In a large bowl, combine the coriander, mint, feta, roasted carrots, corn and zucchini. Add the dressing and toss gently to combine.